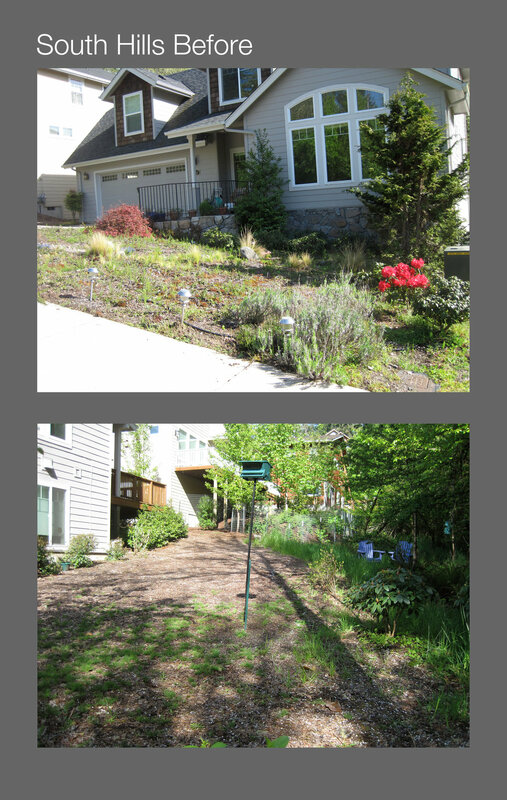 This garden, in the South Hills of Eugene, Oregon, began as a nearly blank slate. Our clients wanted an outdoor living area, suitable for their family of four, with ornamental and vegetable gardens that would include some of their collection of rhododendrons. They were eager for a change, but felt overwhelmed by the challenge of their sloping, north facing, deer-frequented property. Mosaic transformed the uninviting back yard into a warm, welcoming landscape with two distinct outdoor rooms. We designed and built a small, circular flagstone terrace, perfect for two people to enjoy a glass of wine, and a larger stone-bordered gathering space, with a fireplace for roasting s'mores and hot dogs or just keeping warm. 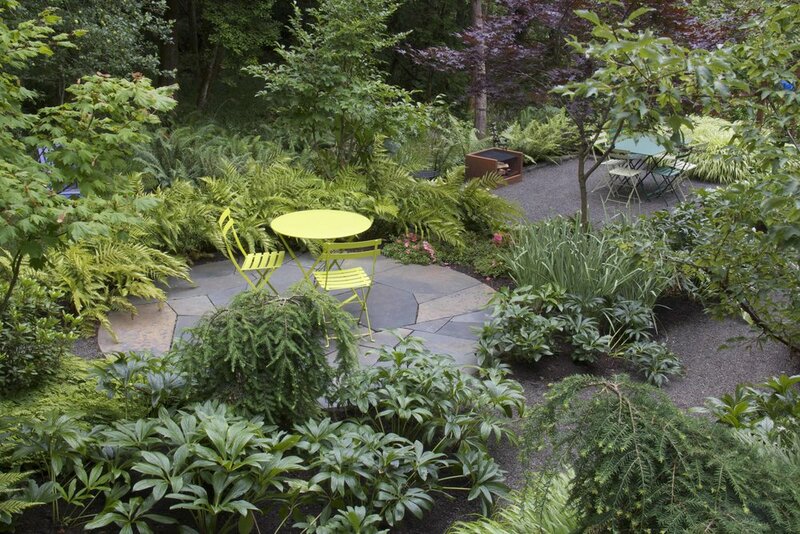 A tapestry of deer-resistant ferns and perennials weaves under small maples and Stewartias, enclosing the outdoor living spaces in drifts of foliage and blending into the natural area beyond. A small, productive vegetable garden is protected from deer by a rusting steel wire fence. 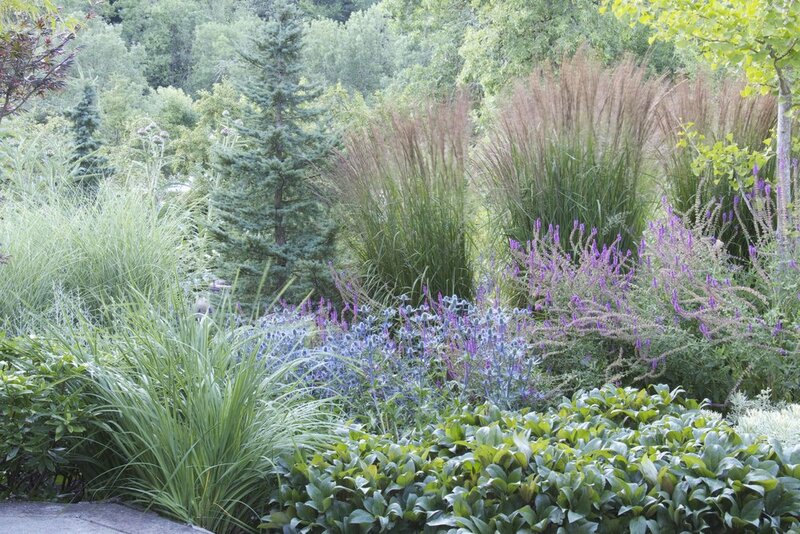 The front garden, which had been planted in weedy groundcovers, became a layered, intricate planting that welcomes attention from the street and house. Pink, white and blue flowers bloom throughout spring and summer while striking evergreen plants to offer year-round interest. A large Vietnamese Urn draws attention into the garden from the street and house, and a trio of matching pots, overflowing with plants, frames the view from the entryway.